Pre-installation discussions are held with the customer to go through their priorities as outlined above. One of the key objectives of these meetings is to establish a time table for implementation with the mutual responsibilities of each party clearly defined. The clear three-way relationship of time, functionality and cost will appear: when more functionality is requested this will have a direct impact on the delivery/cost matrix and customers will be able to make more effective decisions on what their priorities are. Our implementation methodology is deigned to achieve successful live operation of your Fern solution as quickly and as efficiently as possible while maximising the benefits from the system. During the implementation process, we will work closely with you throughout to recommend parameter settings that best suit your organisation, explain functional and technical details of system processes, troubleshoot issues that arise during implementation and transfer product knowledge. Once your system is live, our support team is on hand 24 hours a day to answer your questions and help to keep your business running smoothly. Due to Fern’s philosophy of not employing salespeople but instead having a team of industry-experienced, technically competent personnel who work in both a pre and post-sale capacity, your project manager will have been extensively involved during the pre-sales stage and will therefore have gained an in-depth understanding of the business issues and internal procedures. 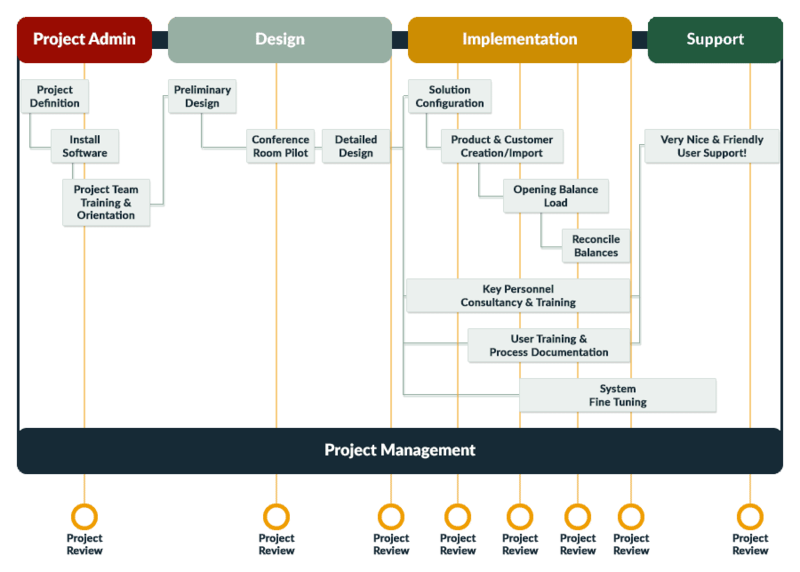 The project manager is the main point of contact during the implementation and is responsible for co-ordinating all Fern resources and ensuring the project progresses to plan. Your project manager maintains contact with you after your Fern system is live, acting both as your account manager and providing strategic advice and guidance where appropriate.